One thing I’ve learned about traveling is that no matter how much research you do online, locals often know better. So when there’s any question about what we’ll be doing in a particular city, I come up with a plan but then sometimes I’ll ask the person behind the check-in counter at our hotel for a recommendation, just to make sure there’s nothing incredible that I’ve missed. Usually this is a waste of time and has yielded almost no useful results but it usually makes me feel better about the comprehensiveness of my research and planning. In Nashville, however, I finally hit the jackpot. For starters, our hotel room was free thanks to all the rewards points I’ve been racking up. That was a nice welcome to the city, and it got better when we got there and it turned out to be a much nicer Comfort Inn than most of the ones in which we’ve stayed. And when I asked the check-in guy for a recommendation, he didn’t hesitate to point me enthusiastically to Ryman Auditorium. I had never heard of it until he mentioned it, but it was the home of the Grand Ole Opry for 30 years before it moved to its current home, the Grand Ole Opry House. 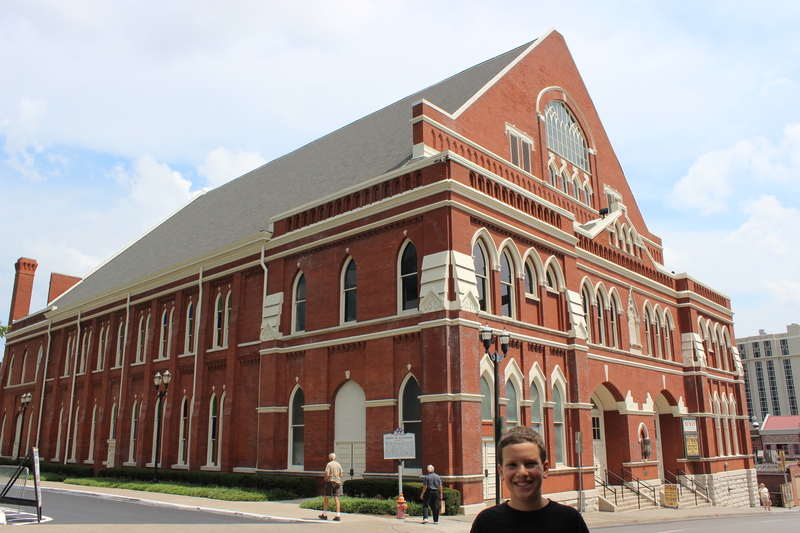 Ryman is still an active concert hall and even hosts the Opry for a couple of months each winter when the Opry House is being used by the Rockettes. And it’s right smack in the middle of downtown–from the corner we could see the football stadium in one direction, the hockey arena in another, and bars and restaurants all over the place. 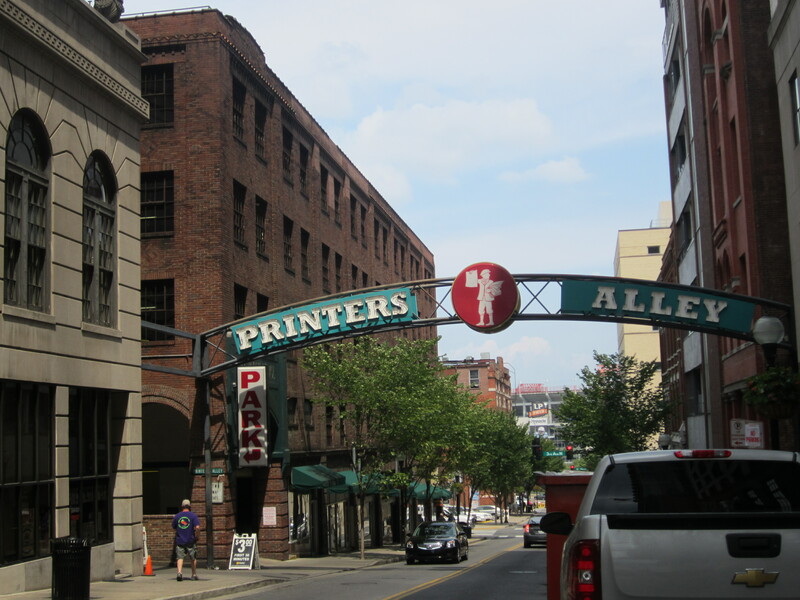 If I can digress for a minute, Nashville has a great downtown area. It’s well-laid out and easy enough to navigate, it’s clean, there’s public transportation and not-too-terribly priced parking lots, and the midday traffic is bad enough to let me know I’m in a real city but not so bad that I want to hurt somebody. It’s not too big to walk around but there’s still lots of variety, sometimes even on the same block. The eclectic mix of banks and government buildings and restaurants and churches and concert halls and sports arenas all jumbled together gives the neighborhood a vibe that’s kind of serious and kind of fun at the same time, which is great. I never really thought about it until today but Manhattan, where I’ve spent many a midday, is far more segmented: restaurants over here, offices over there, music clubs somewhere else, etc. Nashville’s mashup is kind of refreshing and unifying in comparison. Anyway, before we headed downtown, we started the day at the historic Belle Meade Plantation, whose business used to be horse siring and whose horses sired dozens of Kentucky Derby winners. 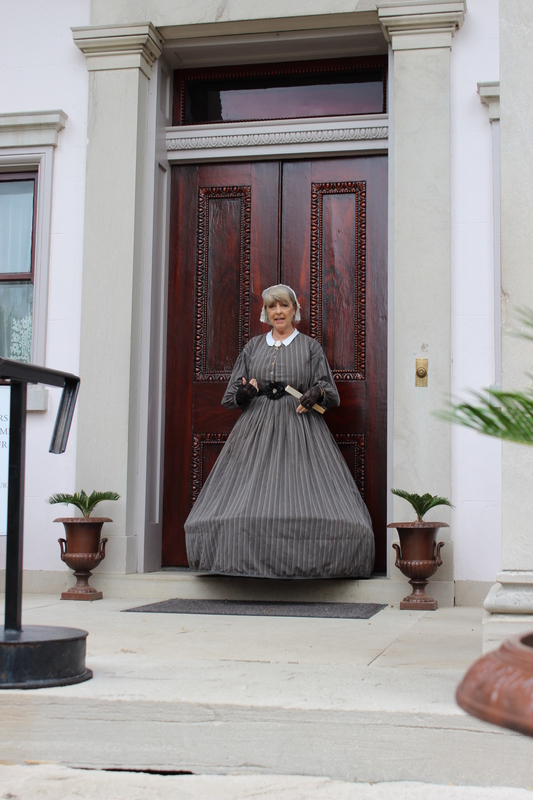 I didn’t know that going in–I was just happy that after screwing up the timing of our planned plantation visits in Charleston I was finally able to tour an authentic antebellum plantation. The grounds were impressive, the plantation house was absolutely stunning, and our tour guide was in full period costume. Sam, however, was bored out of his mind. “The civil rights stuff was like an amusement park compared to this,” he said as we left. Note to self: don’t take Sam on anymore plantation tours. 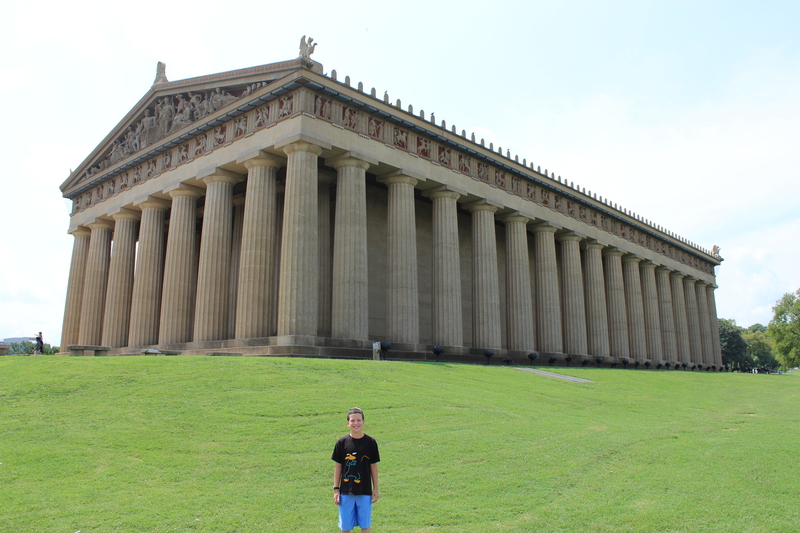 Our next stop was definitely the strangest of the day: a big, beautiful park a couple miles east of downtown Nashville that houses … wait for it … a full scale replica of the Parthenon in Athens. There’s a plaque next to the entrance that explains that it was built in 1897 to celebrate Nashville’s 100th anniversary, but it does not explain how such a building celebrates such an event, or why the Parthenon was chosen as the building to replicate instead of, say, the Coliseum or the Sphinx or the Taj Mahal. Inside the replica Parthenon is a replica statue of Athena, just like the one that was once inside the real Parthenon, because when you’re replicating an ancient Greek building in the middle of a city famous as the birthplace of country music, you simply don’t cut corners. 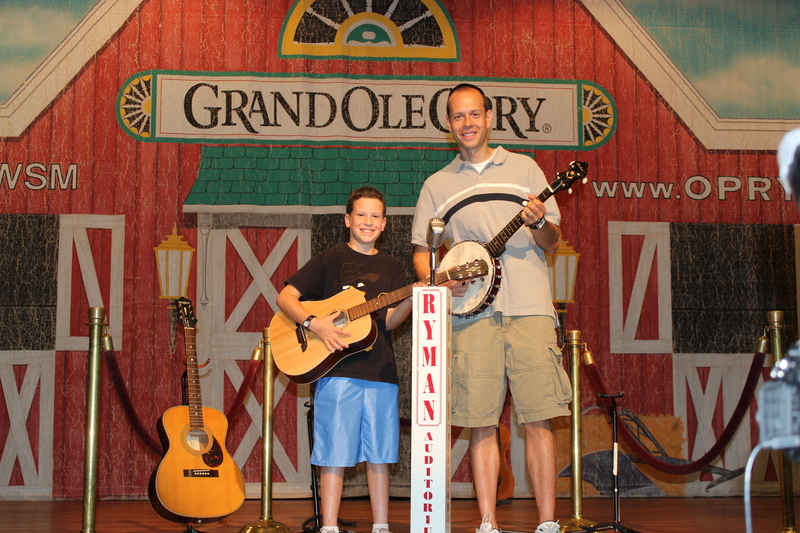 Our next stop was Ryman Auditorium, and Sam and I both had a great time there. I was a little worried that he might not appreciate the history behind a show he’s never seen and a musical genre he doesn’t listen to, but he recognized a few of the names and I think most of all he really appreciated the backstage–and on stage–access we had during our tour. The tour guide was not in period costume but she was lively and entertaining and told some cute stories about the backstage antics of some of the Opry regulars. 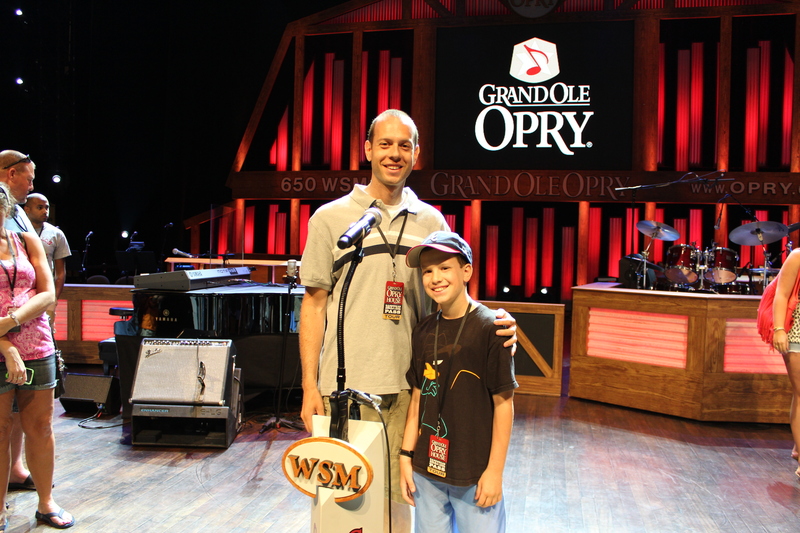 Our last activity in Nashville was yet another backstage tour, this time at the current home of the Opry. The order of our stops in Nashville was determined more by geography than anything else, but I’m glad it worked out as it did because it made a certain karmic sense to see the old home of the Opry before seeing the new home of the Opry, and it also gave the Hamster and me a better appreciation for what we were seeing. And once again, the best part was being on stage, especially because there was a show starting just a couple of hours after our tour ended so everything was already set up. Unfortunately we’re not spending the night in Nashville (we’re already well up into Kentucky so that we can take a morning tour of the Mammoth Cave) so we couldn’t stay to see the show live, but we did listen to a bit of it in the car on WSM 650 AM, the same station that’s been broadcasting the Opry since it started in 1925. It was a nice way to take a little bit of Nashville with us even after we’d left.